ONE A quick scout around a Whistles store in London recently brought me face-to-face with these blingin’ beauties, part of Lulu Frost's new collection for the brand. These are the Sandra ear-rings and with their variety of tones and shapes, they certainly make a statement. But they were €88 which I couldn’t bring myself to spend in the run-up to Christmas and so, sadly, I left them where I found them. For now. TWO This panelled shift dress from Chloé is my latest obsession; I have been practically stalking it ever since I first spotted it on the Outnet here. The elegant shape and colour, the cosy wool blend, the pockets…oh, I could just kiss it, it’s so adorable. The good news? It’s 60% off. The bad? It’s still €798.40. THREE I am also desperate to find a faux fur coat that doesn’t make me look like a miniature Yeti (believe me, that’s no exaggeration. I have sent back two to ASOS so far this winter which made me look like a small square furry abomination). Perhaps this longline leopard number, €111.12 (and also from ASOS), will be The One? FOUR I spotted these gorgeous Dubarry Galway boots on fellow Irish blogger Becky Dazzler, and have wanted them ever since. Don’t they look cosy? The brand has just opened its first flagship store at College Green in Dublin (next door to Abercrombie & Fitch) and are also available widely online (like here, where I’ve taken this picture from). This pair are Walnut; they’re also available in black – but they’re pricey at around €335.00. FIVE Fashionable and functional, these tan leather Chupa gloves from Ted Baker are the very height of sophistimication and not too madly priced either at £59.99 from the Ted Baker website. Like anything you see? And what are you lusting after this season? Such gorgeous earrings, just hope you haven't missed out on them buy not buying...I've learnt that lesson the hard way, believe me! If any of you buy that dress before me I will hunt you down and kill you! Or at least give you the evil eye. Before gushing over how amazing your dress is. So now, be warned! I love all these picks as I could see myself wear them. The dress is super fabulous and so is the coat. Hey girl! Thanks for visiting my blog :) Those earrings are gorgeous! 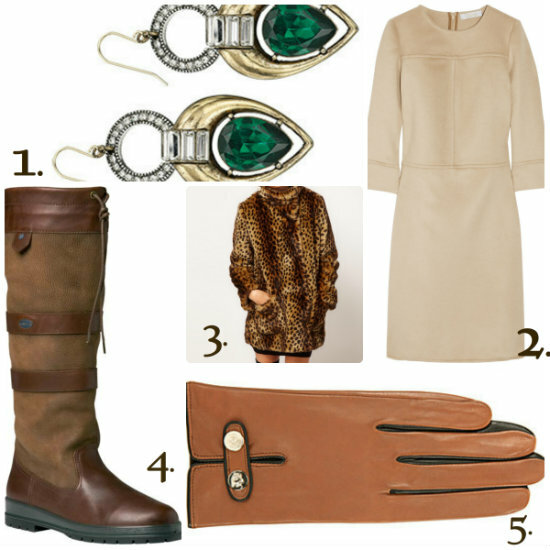 Loving the boots too and I've been eyeing some leather gloves myself. Beautiful wish list altogether!